Aircraft carriers have a habit of denying what they really are. In the 1970s, Britain’s new Invincible class carriers were officially christened ‘Through Deck Cruisers’, to reassure the nation’s bookkeepers that its Navy really had surrendered grandiose pretentions. America’s 40,000 ton Wasp-class flat tops are ‘Amphibious Assault Ships’, despite being instantly recognisable as aircraft carriers, and operating squadrons of US Marine AV-8B Harrier fast jets. Now Japan has joined the international warship-euphemism stakes with the impressively misleading construction: ‘Flat Top Destroyer.’ Launched last Wednesday, this 27,000 ton (full load) capital ship, Izumo sports a full-length, 248 metre flight deck, an all-round visibility flight control island, and a hull that has been subtly sponsoned out to a 38m beam at flight-deck level. To put this non-carrier into perspective, the new Izumo is almost exactly the same size, shape and displacement as the Royal Navy’s old HMS Hermes: the flag ship of the task force that recaptured the Falklands. At the height of that conflict, Hermes operated 26 Harrier jump jets and 10 Sea King helicopters. By contrast, the Japanese Maritime Self-Defense Force asserts that Izumo–the largest addition to the post-war Japanese fleet–will accommodate just 16 helicopters. Of course, the Izumo won’t be setting sail onto seas that are entirely free of state-sponsored ambiguity. For almost a decade after it bought the ex-Soviet aircraft carrier, Varyag in 1998, the Chinese People’s Liberation Army Navy insisted it was using the hull for research. Yet by November last year, this ‘rusting hulk’ had pupated into the shiny 67,000 ton, Liaoning, and was launching and landing Shenyang J-15 fighters, derived from Russia’s highly capable Su-33 air-defence fighter. In the strictest sense, China has been doing research, because the navy has no experience of aircraft carrier operations. But the deck trials with the J-15 fighters was trumpeted with turbo-charged national pride, and re-justified on the basis China needed to be able to secure its maritime interests. 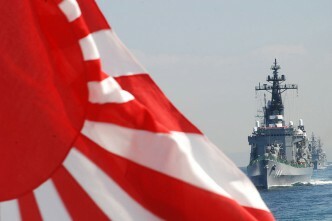 Yesterday, the Japanese government was at pains to emphasise the public utility of their over-sized destroyer. Besides national defence, officials stated it would be used ‘to enhance Japan’s ability to transport personnel and supplies in response to large-scale natural disasters’. To be fair, Japan does use its naval ships for this purpose. In August 2010, the government despatched the almost-aircraft carrier Shimokita—incidentally called a ‘Tank Landing Ship’—to Pakistan to aid relief efforts after heavy flooding. But the clear likelihood is that Japan is intentionally upping the naval ante in the Western Pacific, and the ‘Flat Top Destroyer’ classification is designed to side-step objections. As the Chinese government well knows, Japan could quickly turn Izumo into a powerful, mid-sized aircraft carrier. And the key enabling factor is the imminent entry-into-service of the jump-jet version of the Lockheed Martin F-35 strike fighter. Japan is already a participant in the F-35 program, and has signed up for 42 of the land-based F-35A version of the fighters, which are designed for the United States Air Force. However, the F-35 B, destined for the ships of the US Marines and the Royal Navy, is currently the most advanced of the three versions under development. 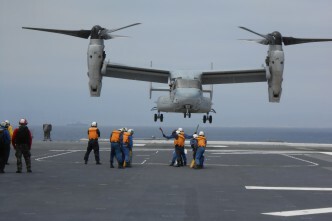 It has already completed its first phase of testing at sea, and is scheduled to enter service in 2015. 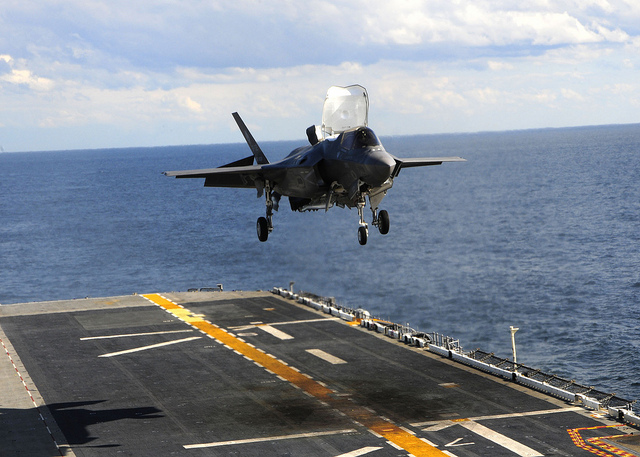 The opportunity to switch some of its procurement to the F-35B is clearly open to Japan. It would be easy for Japanese engineers to construct a ski-jump for the bow of the Izumo, so it could operate these jets in the same manner as the Royal Navy. And it’s worth noting that the Izumo’s flight deck is approximately 40 metres longer, and its flight deck 2 metres wider, than the Royal Navy’s HMS Invincible, which operated 16 Harriers during the Falklands War. This implies a potential complement in excess of 20 aircraft. Alternatively, the Japanese Navy could operate them in the same manner as the US Marines without the ski-jump, though that would impact on bad-weather operations and reduces payload and range. Historically, keeping a stream of trained pilots has been one of the most problematic and expensive aspects of operating jump-jet squadrons. So it’s worth noting that when Japan signed up for its first four F-35A aircraft last year, it also purchased two full-mission flight simulators. These simulators can be used to train pilots for all three versions of the F-35. Not only is the F-35 claimed to be very easy to fly in STOVL mode, but these simulators are also designed to carry pilots through fifty percent of the certification syllabus. The beauty of the design is that Japan can plausibly claim that the ship won’t change the country’s operational capabilities. Indeed, the Japanese government issued a statement in 1998 declaring that ‘offensive aircraft carriers’ are prohibited by the constitution. But Izumo gives Japan the option to escalate capabilities at short notice. This could take the direction of a more balanced, composite amphibious force capability, as described by Euan Graham last month, in which the Izumo is a natural fit. Alternatively, it could take the direction of organic air defence capability, directly mirroring the ambitions harboured for the Liaonning. Operating alone, Izumo would hardly venture into range of China’s land-based forces. But the Falklands conflict—presumably a conflict that Chinese and Japanese naval planners seriously study—demonstrated that approximately 20 jump-jet fighters could fight an attritive battle against an enemy air force five times larger, based 200 miles away–which, incidentally, is how far the Senkaku/Diaoyu islands sit from the Chinese mainland. In the Falklands conflict, the Task Force Commander concluded that two flight decks was the irreducible minimum he needed to maintain operations. So it’ll be very interesting to see if Japan orders a sister for Izumo. Two or three ships would certainly give Japan the potential to quickly recreate a carrier strike force. 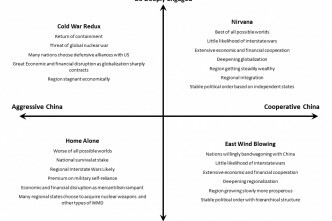 But while successors to China’s Liaoning will doubtless hit the seas with exaggerated claims and tub-thumping publicity, with more Izumos, Japan can quietly counter the escalation: staying its diplomatic hand and conforming to constitutional pledges, simply by building capital ships that provide notional, rather than nominal capabilities. In the highly-charged and not-so-subtle naval arms race currently underway in Northeast Asia, the Izumo is precisely what she appears to be: a shot aimed straight across China’s bows. Phil Radford is a freelance writer, based in Sydney. He specialises in naval strategy and defence procurement. He also researches corporate IT infrastructure and systems in Australia and Southeast Asia on behalf of global technology companies. 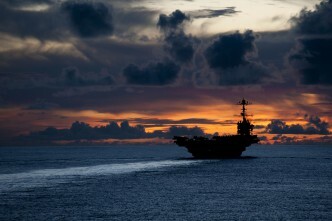 Image courtesy of Flickr user Official US Navy Page.